LIC e services online portal was launched to facilitate LIC customers to buy a policy, pay premium and many other services. The functionalities that were available only at a branch office are now available at LIC Online Portal. In this post, you will learn all the services provided by LIC through LIC e services portal and the process of registration and usage of the site with screenshots. 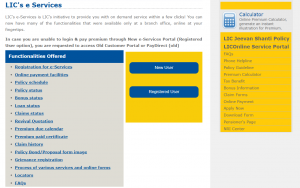 What are the Facilities Available on LIC e Services Portal? LIC Policy Premium Payment: You can pay premium to policies you already have. You can make payment using net banking, Debit card, credit card & UPI. Loan Services: If you already have a loan on policy, you can repay the loan that you availed through branch. You can view the loan status and total loan outstanding, due to date etc., You can also apply for online loan once your request for e-services is validated. Policy Related: You can view basic policy details such as Plan-Term, Sum Assured, Date of Commencement of policy, First unpaid premium etc. You can also view accumulated bonus amount, 1st page of policy document. Details of premiums due during the year (month wise) will be displayed. Premium paid certificates are provided for individual policies up to 3 financial years and consolidated certificate of all the policies that are active with LIC. Revival Quotation: In case of lapsed policies, you can obtain revival quotation. Grievance Registration: You can register complaint/Grievance with the insurer with this facility. Various Online Forms: You can obtain various forms online for your specific need. You can find proposal forms, revival forms, mandate forms etc. on LIC e service portal. These are all the lic e services benefits you can get using this portal. 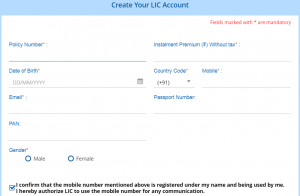 Who can Register for LIC e-Services? Any one who is having a LIC policy for self or for your minor child can register on lic eservices website by filling up the registration form. As soon as the children become major, separate account needs to be created with the minor became major child to avail e-services. Recently, LIC has enabled to add spouse policies as well in the same user account of yours. You don’t need to create separate account anymore for your spouse and children. Registration is mandatory to avail the facilities mentioned above except for premium payment. Non registered user also can pay premium online. I will explain this process later in this post. 1. You need following documents to register on portal. 2. Visit www.licindia.in Customer Portal. You will find following page. Click on ‘Customer Portal’. On the next page click on ‘New User’. You can find detailed description on the facilities provided. Fill the registration form as per onscreen instructions. The registration page is as follows. 3. After filling the registration form, you will receive acknowledgement email. You need to open your email and click on the verification link. Then you will receive OTP on you mobile. You need to enter OTP. That is all about registration. Now you can login using e services login page and use the services. By any chance, if you forgot the lic e services password, you can reset it by clicking on ‘Forgot User ID / Password?’ link available just below the login form. Now i will explain few features that are available on this portal for newbies. Go to lic e services login page. After Successful login to LIC e-service portal, you will find the following page. You can add other policies of your children and spouse. Click on Self Policies, you find following policies. The following page contains online payment receipts, Policy schedule, LIC Policy status, Add new policies, Claim status, loan status, policy premium paid statement in pdf form, revival quotation options are available. Choose the option appropriate for you. This is all about LIC e services online portal. If you have any difficulties in accessing the portal, please do comment below. I will try to help you.